Special KRL coupon at the end of this article. The Finches, Atticus, Scout, and Jem, played by Jim Bonnar, Hannah Suggs, and Aaron Perez, along with their cook Calpurnia (Vanessa Culpepper) live on a street populated by older and mysterious residents. Scout points out that Mrs. Dubose is “close on a hundred” and that Miss Stephanie and Miss Maudie are old too. The trio of ladies is portrayed by Caitlin Hill, Peg Collins, and Pat Jansen. Mystery surrounds the Radleys, who live across the way. Nathan has cared for his brother, Arthur, nicknamed “Boo”, since their father died. The children are curious about, and a bit fearful of, the Radley house and its occupants. Why does Boo Radley never come out? What does he look like? Why has he never run away? Dill, “a pocket Merlin”, comes to spend the summer with his aunt and hatches various plots to make Boo Radley come out. After all, “He might enjoy us!” Alex Quezada and Kyler Williams play the Radley brothers, and Matthew Nudson is Dill. The Finches’ quiet life is destroyed when Atticus, an experienced lawyer, is appointed to defend Tom Robinson (Rod Johnson), falsely accused of attacking a white woman. The woman in question, Mayella Ewell (Bree Cruser), is actually a naïve teenager, saddled with seven siblings and an unambitious father. Bob Ewell (Darryl Smithey), “fired from the WPA for laziness”, is relatively useless, but “if scrubbed with lye soap” his skin is white. Seeing an opportunity to turn Mayella’s actions to his benefit, he gloats in his power over a black man. Harassed because her daddy’s defending Tom, Scout questions Atticus. He explains the need to follow one’s conscious regardless of what others say; even when you know you are going to lose. Scout ponders his explanation. 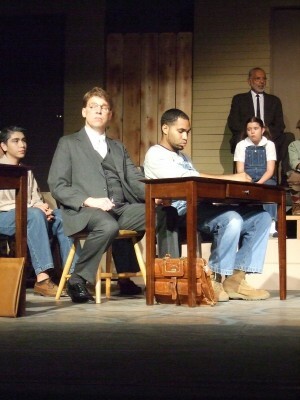 Despite her youth or perhaps because of it, Scout defuses anger and tension when Tom Robinson is moved to the Maycomb jail, helping Mr. Cunningham (Patrick Greer) walk in her father’s shoes. Scout, Jem, and Dill want to attend the trial, but without permission from Atticus, do not wish to be seen. When Reverend Sykes invites them to join him and Helen Robinson in the colored balcony, they jump at the chance. Milton Morrison and Linda Saechao portray the Reverend and Helen. Judge Taylor (Don Brakeman) controls the courtroom with the aid of Sheriff Heck Tate (Michael Callender) and the Court Clerk (Bob Peterson). County attorney Mr. Gilmer (Ron Linden) calls Heck Tate and the Ewells as his witnesses. Atticus brings out astonishing facts on cross examination, convincing Jem that Tom will be acquitted, but Scout has her reservations. Atticus calls only Tom for the defense, rapidly concluding the testimony. Time passes slowly as the jury deliberates, and when they return, Scout notices, “they are not looking at the defendant”. The significance of the jury’s demeanor is not lost on those in the courtroom. When Tom is found guilty, the children are devastated. They do not understand how the evidence could be ignored. Despite Tom’s conviction of a crime he did not commit, Bob Ewell is not satisfied and vows revenge. The form of his revenge and the subsequent consequences could not have been predicted. 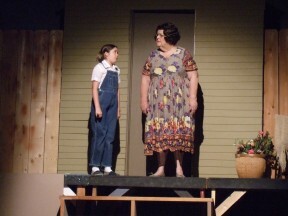 To Kill A Mockingbird is a play that will be enjoyed by the entire family. The show opens at the Ice House Theatre at Race and Santa Fe in Visalia at 7:30 p.m. on Friday, June 22, 2012 and runs for three weekends with evening performances at 7:30 p.m. on 6/22, 6/23, 6/29, 6/30, 7/6, and 7/7 and matinees at 2:00 p.m. on 6/24, 7/1, and 7/8. Coupon good for any performance of the play. This brings back so many wonderful memories! I portrayed the grumpy old Nathan Radley!